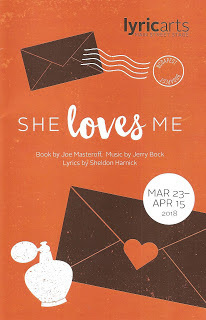 "She Loves Me is such a charming musical that it's the perfect show to start spring off. It's light-hearted, joyful and hilarious, the perfect musical rom-com. The cast clearly enjoys the production and performs it with such passion that I really do wish I could go back. Lyric Arts musicals tend to sell out quick so I'll save myself from purchasing one so that someone else can see it!" "It's a sweet love story between two strong people who know what they want and won't settle for less. [...] Director Scott Ford has assembled a large and talented cast, with familiar faces and newcomers to the Lyric stage. In the latter category are our two leads, Katherine Fried and Joseph Hitchcock, who couldn't be more charming or sound more lovely. Both are extremely talented."